At age 4, I told anyone who would listen that I was going to grow up to be a dog trainer (so my mother tells me.) I taught my childhood dog tricks, complete with jumping over bushes and the swing-set, and made/begged the whole neighborhood to attend the shows for 10 cents each. After I completed my BA in English at The College of Wooster in Ohio, I bought my first German Shepherd and have been in love with the breed ever since. 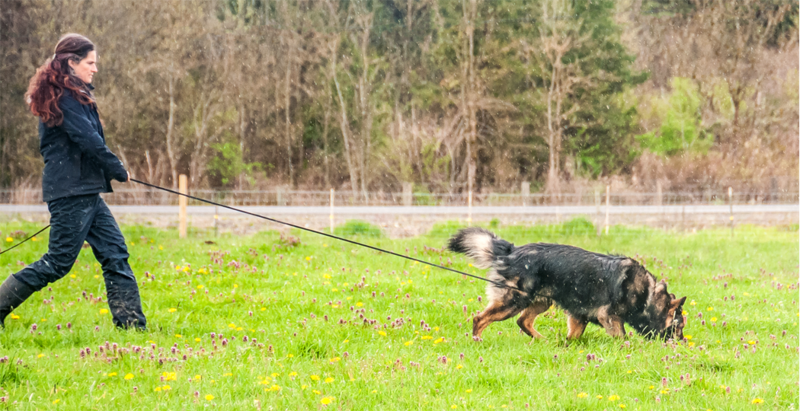 That fascination led me to Schutzhund, which is a breed test for GSDs and to competitive dog sports, which in turn led me to teaching lessons to other dogs and their humans. In 1994, I achieved my dream and took the plunge into dog training for a living. Along the way, I worked as a kennel manager, a veterinary technician, a dog groomer, and attended many continuing education seminars and workshops to attain the knowledge I now use. These days I compete in Schutzhund and AKC obedience with my current dogs, teach handlers how to play with their dogs, and teach humans how to teach their dogs to live in this complexing world, as well as problem solving behavior of all kinds, including aggression. Currently, I would consider myself a clicker trainer. What that means to me is that behavior is the dog’s choice, and it’s up to me to control their access to reinforcement and teach and motivate the dog so that he chooses what I want. That lightbulb moment when the dog hits on the right behavior and then repeats it again, I love that! I believe that when you respect the dog as a thinking partner in the learning process, you come away with a much greater understanding of why he acts the way he does, and can create strong, confident and clear behavior skills. Over the last 20 plus years of training dogs, I’ve used all sorts of tools, including e collars and prongs, treats and toys. I’ve morphed into using primarily positive reinforcement these days, and do not find it necessary to use any pressure or correction based tools to achieve life manners, behavior modification or sport (AKC or Schutzhund) behaviors. I specialize in high drive dogs, and love to teach their handlers how to channel their prey drive and arousal issues into reinforcement that the handler controls, along with teaching the dogs how to be calm and not adrenalized 24-7. You can see my achievements with my individual dogs on their page, since basically I couldn’t have done anything without the dogs that I have partnered with.